Dress materials are unstitched cloth materials that are available in meters, which can further be used to stitch an outfit from a tailor or a designer according to our body type. These cloth pieces are available either in single color or multicolor, plain printed or embroidered. You can choose the one that perfectly suits your need as per your desire. These fabrics are amazingly fabulous and suits for all ages groups and occasions. 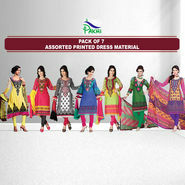 Dress material comes in various fabrics like silk sweet, crepe, sober cotton, georgette, etc. You can go for online shopping of desired cloth materials from Naaptol.com where you can find various attractive design and patterns of the same. These are made of premium quality raw material with ultimate designs. Hence, you can buy amazing cloth materials from Naaptol, India's largest online shopping site, at heavy discounts, enjoying hassle-free shopping experience. If you are among the ones who never seem satisfied with the fitting of readymade garments then you are at the right place. This webpage offers you with a huge collection of women cloth materials that allows you to enjoy wearing customized dress, stitched according to your taste and specifications. All you need is a perfect piece of cloth as per your desire and a well groomed tailor and you are done. Its great way to get your outfit stitched in your own style to make your own fashion statement. Hence, Naaptol brings to you some of the beautiful and sassy cloth pieces which you can design by yourself. Get these unstitched cloth materials from brands like Midas, Rajrang, Adah and many more. The ethnic patterns and soothing floral will definitely give you a chic and stylish look. Get them stitched the way you like and flaunt your unique style statement. Go for collared necks or boat neck with churidars, deep backs, or a simple cut sleeve suits.